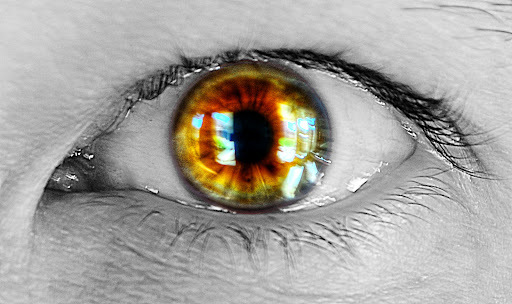 This shot is an HDR photo built off of three 2EV bracketed shots of my eye. I did the HDR treatment in Photomatix and most of the post-processing in GIMP. I suppose the most interesting thing about it is that I used a layer mask to composite the HDR iris into the original 0EV image, so only the iris is HDR. The reason I did that is because the HDR skin tone was way too grungy -- it made me look like I hadn't showered in months! Then I desaturated everything but the iris to make the iris really pop. The concept is completely unoriginal, but it was one of many study shots I've been doing to improve my general photography, HDR, and post-processing skills. I also learned that it's damn tough to sit perfectly still for an extreme close-up through 3 fairly long exposures! If I were doing it again, I would lay down on the couch so that my head is rested on a something and was easier to hold still. Then I'd rig the tripod to point down at my eye. That would help the sharpness of the photo tremendously. I'd also arrange the environment so that the reflections off the eyeball weren't so distracting. If you study it, you'll see my back patio as viewed through my living room windows!